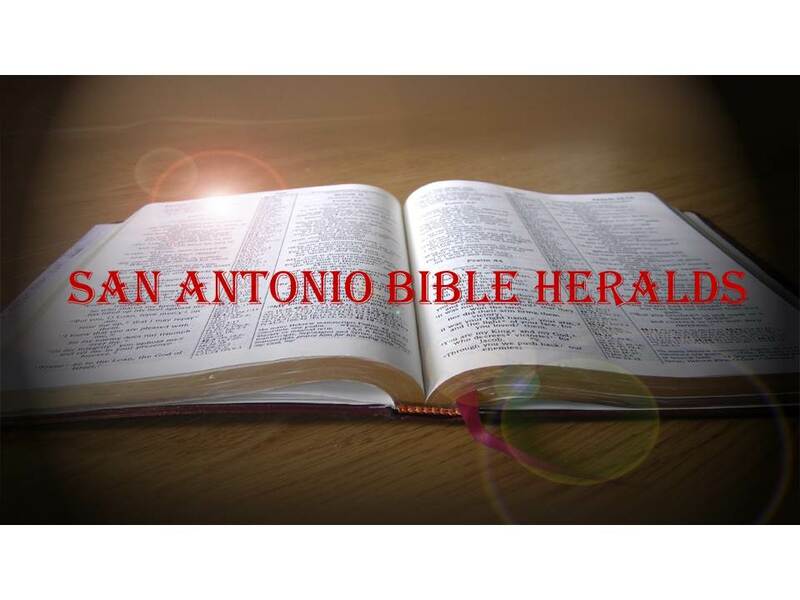 San Antonio Bible Heralds: Some thoughts on Richard Dawkins' "The God Delusion"
No doubt Mr. Dawkins is, as so many atheists and other non-believers, dedicated to the destruction of faith. As the saying goes "misery lovers company" and for some reason, which seems to escape me, many atheists feel it is their mission in life to destroy the faith of others. Now, I know the stated reasons for Mr. Dawkins' "crusade." He is supposedly out to ensure that religion does not continue to cause the irreparable damage that it has already done, especially to children. But those of us who understand the Bible and the truths contained therein, understand that people such as Mr. Dawkins engage in their tirades simply because they are, in the words of Romans 1, "suppressing the knowledge of the truth." Of course, Mr. Dawkins and those who are like-minded will point to this statement as a clear example of the very thing they have been saying all along: religious people are unthinking and unreasoning and they follow their faith in contravention to any and all evidence to the contrary. According to Mr. Dawkins, if he was presented with evidence that evolution was not true, he would change his mind in a heartbeat. Don't believe it for a minute! People have their traditions and deeply held beliefs, in the case of the atheist he is wedded to the idea that there is no god. Very few will, as C.S. Lewis did, who by the way is derided by Mr. Dawkins in the book, change their minds when presented with evidence contrary to their world view. What is really the saddest and most disturbing aspect of this book, aside from its obvious contempt for religion and religious people in general, is the fact that it drips with arrogance and disdain. Mr. Dawkins spends a great deal of his time deriding religion in general and the actions of some practitioners in particular. He tells the reader in the preface that the accusation some have levied against him that he picks the worse of the lot and makes them his case studies is not correct. Then he proceeds to do just that in citing the bad behavior of people such as Pat Robertson, Fred Phelps, Jerry Falwell, etc. Believe me, if you want to find them there are a mountain of examples of "religious" people doing bad things in the name of religion strewn throughout history. But just as Mr. Dawkins would not allow me to call someone an atheist who says he thinks there might be a God, neither can he get away with calling "Christians" whoever happens to make some profession to that effect, but then goes on to behave in a manner completely contrary to that faith. When it comes to Mr. Dawkins' biblical understanding, suffice it to say that it is right up there with the knowledge that the average Muslim has of the gospel. He shows his amazing ignorance of the text in the way he goes about handling, or rather, mishandling it. We have the usual "the Old Testament is the book of a people who made up a vindictive, and bloodthirsty God for their own self-aggrandizing purposes." But we also have an individual who has no interest in fairly and honestly interacting with the text. A vivid example is his contention that the gospel writers made up the birth of Jesus and that Luke invented Augustus' census so as to place Mary and Joseph in Bethlehem at the time of Jesus' birth. He tells us, authoritatively no less, that the Romans would not do such a thing and that, if it is true that there was a census under Quirinius in 6AD, there wasn't one during the time of Jesus' birth. He completely ignores the solutions that have been proposed which are solid and very plausible. In addition, this is a good example of the "primacy of the modern," the idea that, if modern "scholars" say something is true well then by George it must be! We are led to believe that a "scholar" thousands of years removed from the events is in a better position to tell us what really took place than someone who is writing about them 60 years after they happened! Here we have an individual who is openly and obviously hostile to the Christian faith telling us that the Bible cannot be trusted and trying to prove his point by being dishonest and mishandling the text. And his primary source is a "scholar" (Bart Erhman) who himself is hostile to Christianity, who apostatized from the faith, and who, by his own description, is an agnostic. This is the kind of shoddy scholarship that people engage in when they are doing nothing more than trying to win an argument. But where Mr. Dawkins really waxes irate, is in the chapter where he decries the "religious indoctrination" of children. He goes on to cite (again going against his stated purpose in the preface) a myriad of examples of children who have been abused by religious individuals to buttress his case. Again, the number of examples that can be cited in this area are legendary. If you want to find 10, 100 or 1,000 of these examples you can certainly find them. But once more, the fact that people mishandle the scriptures (as Mr. Dawkins himself does) and justify all kinds of things in the name of the Bible does not make them true believers. Was it not Jesus who said "by their fruits you shall know them?" (Luke 6). I could go on and on, but I'm sure you're probably tired by now. But in conclusion, the most important things that I gained from this reading are a couple of important facts. In the first place, the fact that our witness is so important and that it should not be neglected. I agree with Mr. Dawkins that the actions that people who profess Christianity carry out will speak volumes as to the truth of the scriptures. If people see in us a contradiction between our lives and our faith, that will have a much more negative effect on them than our words can ever have. We can speak of the truth of the gospel all we want, but if our actions are not in keeping with our words, the hearer will dismiss us just as the author of this book has. Lastly, it is important for us to understand the foundation of our faith and to know that it is reasonable and rational. Contrary to what Mr. Dawkins claims, we don't believe simply because we have been indoctrinated and we don't have a mind of our own. Or we're seeking some sort of comfort, or, as he posits in the later pages of the book, we have an evolutionary tendency to this "religion virus" that developed over millennia and originated from our need to have imaginary friends to depend on. To be sure, there are things that we accept as faith because they will always be matters of faith. Christianity is a faith and that fact should never be hidden or apologized for. There are things that the mind will never be able to grasp, but contrary to the gap theory that Mr. Dawkins advances, this does not mean that we're seeking to fill our gap of knowledge with God. The events that the New Testament describes are factual, they can be corroborated and they are time-space events that took place in a specific setting and were witnessed by many eye witnesses. Mr. Dawkins' dismissal of those of us who believe is breathtaking it its arrogance. He dismisses with a wave of the hand the many logical, reasonable and rational reasons that have been put forth for first, the existence of God, and then the truth of the Christian faith. It behooves those of us who believe to be on guard for the many people in our society who will look upon books such as these as the final word in matters of belief.